It’s a lovely idea. I’d arranged to meet a member of my Society of Children’s Book Writers & Illustrators’ critique group each Friday, for some serious, no-chat, just get on with it writing. It’s a gorgeous, old-school library: all wooden parquet floors, tall shelves and stunning stained glass windows, wonderfully combined with historial artefacts and all the current magazines you could possible want for a day’s displacement, I mean research, activity. Friday: get up late. Persuade daughter that sad packed lunch of tiny bread and cheese and water is character-forming opportunity to cook for herself later. Swear at person slowly paying for Tube ticket in single coins of unknown currency. Sit in train in tunnel while driver says she isn’t sure why we are there. Make will in diary. Avoid psychotic black cab driver bent on pedestrian destruction. Shiver on icy street. Chat brightly to SCBWI member who has arrived and desperately try to recall meeting them at conference as described. Gaze at lovely surroundings and take seat closest to radiator. Arrange six notebooks containing bits of writing, plot ideas, character sketches in optimum position on desk. Gaze some more. Hate main character. Gaze some more. Loo break. Look at postcards and consider purchase of tote bag to add to enormous collection of unused tote bags. Sneaky look at social media. Set up app to prevent sneaky looks at social media. Rewrite first paragraph. Rewrite rewrite. Check how much of scheduled undisturbed 30 minutes has gone on new app. Decide it can’t be only two minutes. Gaze at surroundings. Discuss lunch and possible attendance at free classical concert in next room. Go for lunch. Return to find out another writer has arrived. Whispered discussion of progress. Agree surroundings are magnificent. Reset app. Spot stacks of books for sale. Examine dozens of books at length. 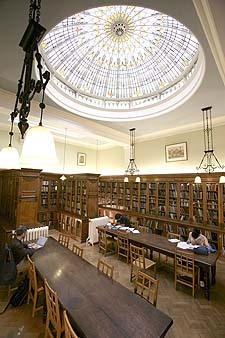 Remember recent clearing of hundreds of books. Reset non-disturbance app. Rewrite rewritten rewrite. Consider turning contemporary ghost story set in England into historical fantasy set abroad. Start planning series of blog posts for newly-commissioned work. Gaze some more. Find text from friend who has arrived for catch-up. Meet friend for hot chocolate with writer in cafe. Discuss translation, educational IT, websites, photos, daughters and NHS. Announce must return to writing. 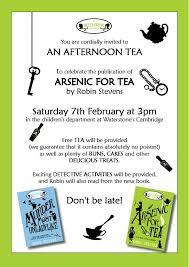 Meet staff member and discuss London Fortean Society meetings, children and writing. Agree surroundings are magnificent. Anxious call from A Level burn-out casualty. Plan evening of writing to email for comment from writing partners. Divert to bookshop to buy two brilliant new books published this week by Robin Stevens and Melinda Salisbury. The clothes and books are decluttered. Now there’s paper, paper everywhere and all the (blog) posts did shrink. This tiny belated paragraph is just to note the passing of more than three decades of wage slips; cheque book stubs; credit card statements; receipts for baby products (for someone who willl be 18 in under a month); birthday, Christmas and a shop display variety of greetings cards … My friend’s industrial shredder is complaining but the worst cupboard is yet to come. If anyone’s thinking of such a clear-out: it’s hard work but so well worth it. I see The Hazards of Too Much Stuff is one of the best read BBC features today. I know the subject strikes a chord with many but it’s quite a rigorous self-examination process. 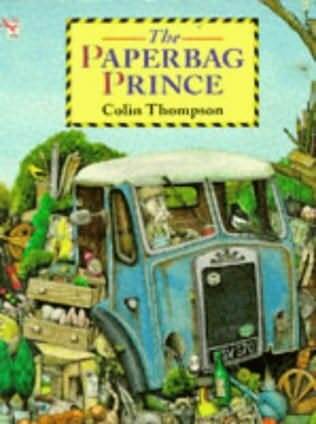 The picture is from one of my daughter’s favourite book’s when she was small: The Paperbag Prince sifted through the valuable things others didn’t want any more. Once the place is sorted, the tricky thing will be not to start over again. I don’t want to add to his load or waste resources any more. The great Declutter continues and the focus turns to books. I thought this would be difficult and I was right. As I mentioned in my last post, Tim Harford’s feature on dealing with the status quo bias that causes stuff to build up at home inspired me. He notes that Christmas books mean double-stacking the book shelves. If only. Triple or quadraple or any n-aple stacking wouldn’t deal with my book habit. 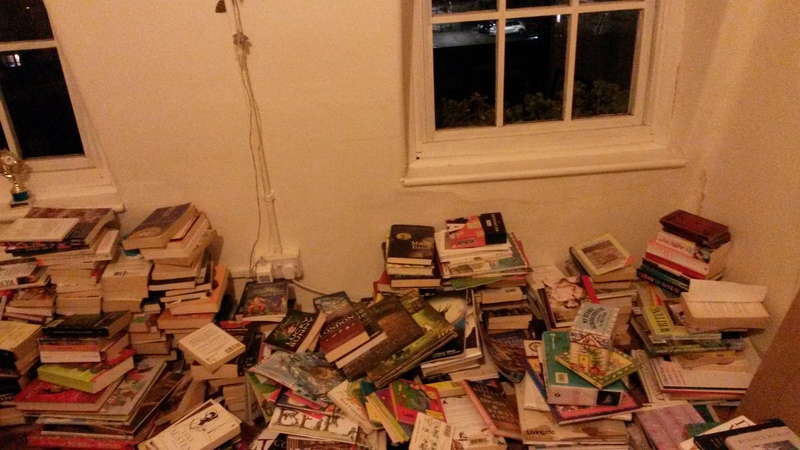 The bookshelves and cases were rammed; cat hair-trap piles had built up behind the sofas and chairs, under the bed and desk, and the out-of-reach hall shelf. Books lurked on pretty much every available surface. The clear out method Tim Harford’s used, by Marie Kondo, means piling items of one kind from anywhere in your home all together on the floor, then holding each one at a time and asking whether it sparks joy. If so, it stays. It’s also important to do this in one session if possible. And no stopping to read. Stage 2: which spark joy? Work and family and writing mean this can be challenging but I put aside hours at the end of last week. There’s still one little heap to finish but I’m so pleased with the results that I’m posting this now. War and Peace: gone. I’ve tried to read that book time and time again over four decades. I’ve borrowed it and bought several editions. It just made me unhappy and guilty and feel stupid. No more. Take that, Russian classic. My copies of Emma and Mansfield Park are falling to bits and I love them and reread them often. But Persuasion went. And so on. What a liberating, painful, tiring and just downright HARD thing to do. Note the loo paper for a mixture of flu-y snottiness and weeping at memories invoked at the interim, pick up and consider each thing stage. But it works. I’ve got what I wanted out of it. I can see floorboards, found missing papers and photos used as bookmarks, and removed unjoyful or repeat volumes to allow in the new. Where appropriate, of course. All Moomins, old and new, are still here. And now I truly appreciate my visible books. I’ve got shelves of books that do bring me joy: personal, eclectic and relevant. There are new Young Adult and Middle Grade gems, precious signed books including Neil Gaiman and Russell Hoban and David Sedaris, and random loves from my diving handbook to a guide to Devon’s hedgerow birds from my honeymoon. And the rest? Some have gone to people I know. A kind friend helped me load the others into his car and looked out for traffic wardens while I dragged bag after bag into an East London charity shop. The woman behind the desk was cheerful at first: ‘Lots of books? Fine!’ but started whispering ‘Oh my days!’ once I’d filled all the space in her store room. I hope people will get something from them. I did, of course, from nearly all of those that went. 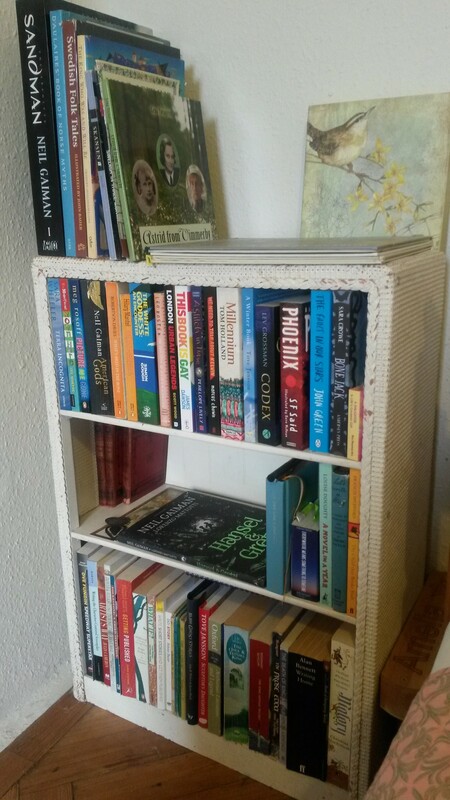 But now my living room shelves are terrific and, look, the bedside bookcase is just the best. It’s in glorious order: half of my previously dangerously wobbly To Be Read pile, research for my work in progress and a couple of comfort books in case of storms or insomnia. And room for more … Speaking of which, I liked this story of a reformed book buyer from the Perpetual Page-Turner blog. Decluttering is a resolution thing, I know. It’s a constant, time-wasting, procrastinating, energy-sapping vampire thing for me. I’m tidy but ugly, make myself wretched sort of tidy; a make everyone else unhappy while I up end it everything, swearing loudly, every few weeks style of tidiness. I can never find the notebook I wrote a synopsis in on the train amid so many notebooks on the desk, floor, or in the cat basket. I’m late hunting for my keys and boots. I buy new lip balm because the tin is in another bag. I have a LOT of tins of lip balm. Then again, my keys may be under the magazine I loathe myself for wasting money on. The one with the experts’ advice on decluttering. I know how that ends: another few evenings of gazing sadly at into a box of unidentifiable cables under the jiffy bags I keep in case of needing them for post. You get the idea. Then I read Tim Harford. I read his article, got the book on the Kindle and read it until the early hours yesterday. I’m unsure about what process led me to trust Tim Harford when the same tidying expert featured in the magazine I’d had bought a few days before. But I’m glad I did. The method advocated by Marie Konodo feels made for me. Many of the cases she’s dealt with are two-bedroom flats in crowded Tokyo – not so very different from my home in London. I don’t have a large house or valuable inherited stuff to worry about, and I love simplicity and clarity but feel emotionally invested in objects. So I started as instructed with clothes. I found clothes hanging up in and in baskets on the wardrobe, baskets in the cupboards, clothes hanging on the back of doors and in the hall, piled up on two chairs in the bedrom and in a suitcase under the bed. And I believed I have no clothes – they don’t really interest me and I wear the same things all the time. I did the process pretty much as described – held each piece and told jackets they’d done a good job and I was grateful, or they’d been valuable in showing me how they didn’t suit me or hadn’t been a good way to spend money. Goodbye and thanks to the wildly extravagant bronze silk dress with floor-length trailing medieval style sleeves, bought from a tiny boutique in Stockholm while a friend and I chatted to a gorgeous poet choosing her red wedding dress. And the leather jacket my daughter’s father bought in Amsterdam, when he lived around the corner of Anne Frank’s house, and I spent days felled by food posioning from a dodgy mussel after first wearing it. There’s the black dress bought for the wedding of a neighbour, who had his heartbroken by a woman making a marriage of convenience. Another black dress was for my 50th birthday party, hated and never worn since. I filled two carrier bags with socks: mismatched black pairs, As MK says, they’d gone saggy around the top as I’d twisted them into tight lumpy balls. There’s a suitcase full of clothes for the charity shop and a rucksack full to go with it, as well as a tote bag of boots. Backs of cupboards were stuffed with odd running gloves, a suit jacket with shoulder pads almost as wide as the entrance to the doorways and the surgical-looking strapless bra I got for my wedding. I found pair after pair of black trousers, a dress I bought for a formal dinner and wore only once, barefoot by a pool in France last summer and the Jack Wills t-shirt my daughter gave me and I wore when I wrote on a naked Amanda Palmer at her Kickstarter party. That’s the hard thing. Getting rid of stuff when it’s invested with so many memories. Part of me wants to hold on, and it’s a good thing those bags are going to the charity shop this morning before I change my mind and start taking things out to make them look as small and insignificant as possible, rolled up in and hidden behind sofas or sneaked down to Mum’s house. MK’s customers have done much the same, and she details the reasons why this is not a good idea. So I’ll move on, to the next group of items to be be removed from every one of the places they are kept, and piled on the floor for the process of sorting. And that next group is books. Same protocol: examine each one but don’t start reading, discard any that don’t bring you joy. 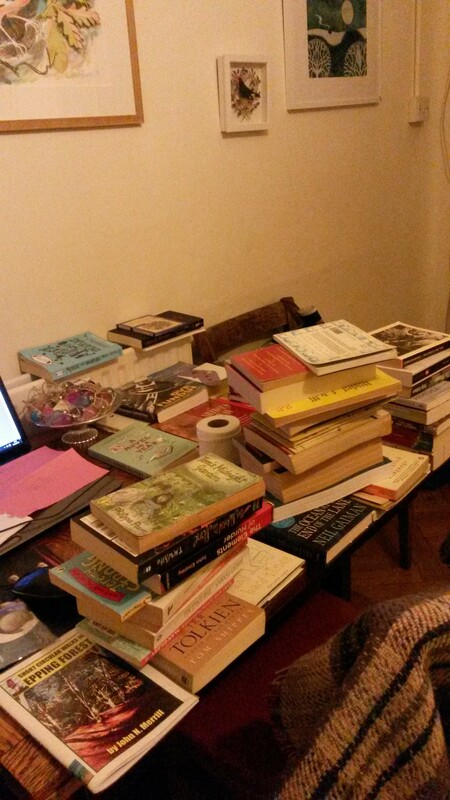 Much of my flat is books. What could possibly go wrong? 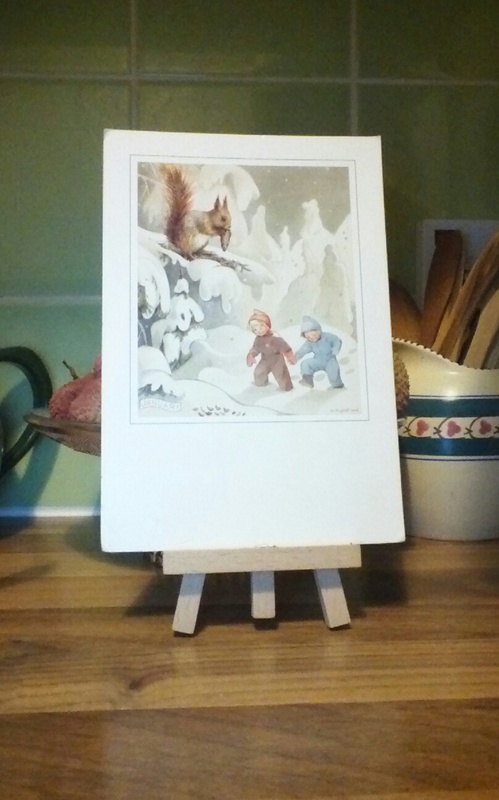 Annual changing of these lovely illustrations by Kerstin Frykstrand from December to January. A bit late in a day of technologies conspiring against me but it’s ok because there’s been writing, good books and food, and plans with friends.